NFL quarterback contract extensions are breaking records on a yearly basis, and lately we’ve seen players one-up one another within months. There’s a new crop of young quarterbacks set to reap the benefit of this trend. Russell Wilson is already established, but whenever he signs a new deal with Seattle it’s thought he’ll sign the richest deal in NFL history. What that looks like is a deal worth well over $30 million per year — something the next wave is going to be riding as well. The big picture: The next wave of young NFL quarterbacks after Wilson set to haul in huge contract extensions offer plenty of risk as teams put it all on the line. With that in mind, let’s examine who they are, and why there is so much risk involved. Bucs have a huge decision: The Tampa Bay Buccaneers have one more year to figure out if Jameis Winston is their guy, or if he’s going to end up as a big-time bust. Winston has plenty of arm talent. Yet his decision making has been truly abominable at times over the course of his career. Interceptions are a big problem. Last year alone, he threw 14 interceptions in just 11 games and was benched twice for it. Over the course of his 56-game career, Winston has thrown 58 interceptions. Additionally, Winston often fumbles the ball, sometimes because he simply isn’t taking any care to secure it. Tampa Bay hopes Bruce Arians can fix Winston. If he can’t then probably nobody can. Oh, my stars: The Dallas Cowboys have already made it clear they’re ready to heavily invest in Dak Prescott. Despite putting up solid numbers when it comes to completion percentage (66.1%), touchdowns (67) and interceptions (25), Prescott has some big-time deficiencies. As we recently detailed, Prescott has never been the man in Dallas’ offense — instead, that mantle has fallen on Ezekiel Elliott. Pocket awareness is one of Prescott’s deepest flaws. He tends to see things too late, and by that time the play is done. His 56 sacks a year ago highlighted this to a T. Even worse, Prescott will sometimes run right into pressure. Prescott also struggles to hold onto the ball. He led the league with 12 fumbles last year, and he’s had 25 in three years. 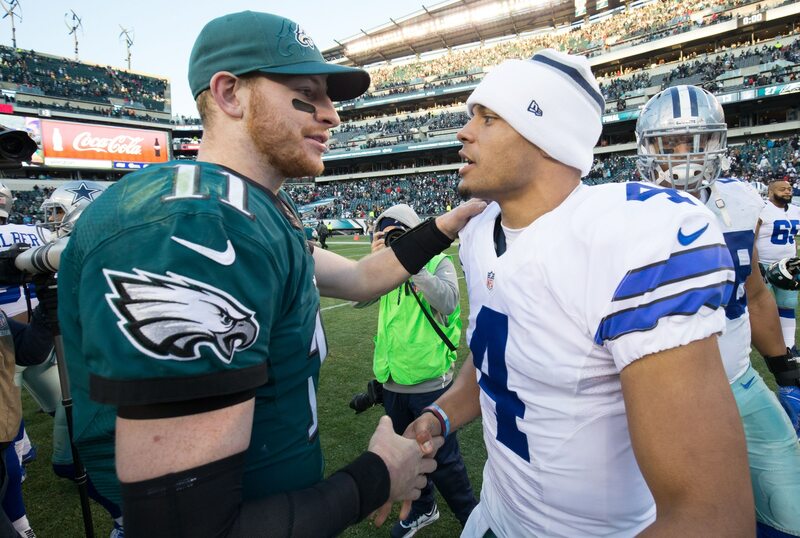 Additionally, Prescott lacks one thing most great quarterbacks have — anticipation. He tends to need to see someone open before he throws the ball. That’s not ideal. Despite all that, Prescott is guaranteed to land a huge contract with the ‘Boys. Philly’s sometimes star: The Philadelphia Eagles have pinned all their hopes on Carson Wentz after letting Nick Foles go. But was that a smart move? The big problem with Wentz is that he’s missed significant time due to injuries the past two years. Is he injury prone? That remains to be seen, yet it cannot be ruled out. It’s also worth pointing out that Wentz somewhat regressed in 2018 before his back injury. His touchdown percentage dropped precipitously while his interception percentage was slightly worse. Finally, there’s no doubt that as good as Wentz has been early in his career, Philly’s offense flowed much better when Foles was under center. Letting Foles go was a big risk all in itself. Whenever the Eagles pay Wentz, that decision will be magnified all the more. Rams playing it coy, for now: The Los Angeles Rams haven’t made any move toward an extension with Jared Goff, but that move is on the horizon if he continues to thrive under Sean McVay. Playing well in big games seems to be Goff’s biggest downfall so far. In four postseason games, he’s completed just 55% of his passes for 971 yards with two touchdowns, and two interceptions. Goff’s performance in Super Bowl LIII was nothing short of disastrous. He was overwhelmed and missed throws he’d normally make in his sleep. There has been chatter than the Rams might be waiting to see if Goff will continue to trend upward before giving him a contract extension. Assuming he does that, it’ll be interesting to see if he can play up to it when everything is on the line. The bottom line: All four of these young players have star potential. They also have shown some big flaws. Yet given the dearth of talent at the quarterback position around the NFL, it’s clear they’ll get paid big money. And it’s also just as clear that not all of them will pan out.